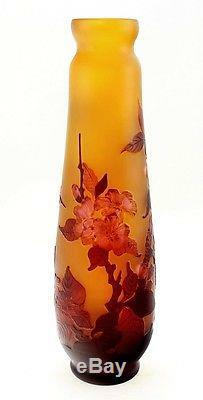 Cameo Glass Art Nouveau Vase with Birds 11-3/4 Inch Tall Signed Galle Tip. Material: glass Height: 11-3/4 inch Width: 3-1/2 inch at widest point Signed: Galle, Tip Condition: excellent, no chips, cracks or repair It was made by a group of European artists using the same techniques, which been used by the French master. Made in Romania SKU: GL-201653. The item "Cameo Glass Art Nouveau Vase with Birds 11-3/4 Inch Tall Signed Galle Tip" is in sale since Friday, January 27, 2017. This item is in the category "Pottery & Glass\Glass\Art Glass\Other Art Glass". The seller is "offerdeals" and is located in Colorado Springs, Colorado. This item can be shipped to United States.